Public sector oil marketer Indian Oil Corp. Ltd (IOC) is entering into an exclusive tie-up with New Delhi-based consumer products firm Dabur India Ltd for a rural retail business. The oil firm’s 1000-strong chain of retail outlets spread across the country will stock a range of Dabur’s Ayurvedic products, including over-the-counter medications and cosmetics. A formal agreement between the two companies is yet to be signed. IOC has drawn up plans to extend its retail presence to non-fuel items and already offers a range of products from financial services to vegetables and stationery. “We are looking at widening our product base to essential non-fuel items and FMCG (fast moving consumer good) items and reach out to rural women," said A.M.K. Sinha, executive director, retail sales, IOC. “However, as rural customers are more price-sensitive and conservative, we were looking for quality products that could be made available at their price points." A senior Dabur India executive, who did not wish to be named because he is not authorized to talk to the media, added that the proposed tie-up will boost the company’s presence in rural markets. He said the firm already has very strong products such as Dabur Amla hair oil in smaller packs for the rural market and Dabur Red toothpaste and toothpowder but that the tie-up would give it an opportunity to retail across 1,000 additional outlets. The executive said a line of baby-care products would be among the products introduced. Around half of Dabur’s sales turnover comes from rural sales. Dabur executives were unavailable for comment. Dabur’s Ayurvedic products include the Vatika range of hair oils, shampoos, fairness creams and packs as well as over-the-counter medications such as Chyawanprash, Isabgol, Shilajit and Gulabari. IOC’s rural retail outlets, called Kisan Seva Kendras, sell a host of products including financial services, agricultural implements, farm inputs such as seeds and pesticides as well as vegetables and stationery. The firm also offers money transfer facilities at select outlets through Western Union. IOC has drawn up plans to strengthen its rural presence by further by increasing the number of stores to 1,500 by the end of the fiscal year and to 5,000 stores by 2012, Sinha said. IOC’s Kisan Seva Kendras service nearly 50% of the fuel needs in rural India. 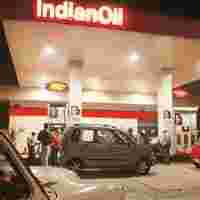 “The challenge for IOC is to convert the assured footfalls that they have in their fuel retail outlets into buyers for the non-fuel items too," said retail analyst Gibson Vedamani. “From that perspective, the IOC-Dabur tie-up has a lot of potential as both the companies are well-known names for rural folks and the availability of both brands under the same roof should spur sales." In 2004 when IOC launched its non-fuel retail business, it had segmented its efforts into urban, rural and highway with a proposed investment of Rs750 crore. While the rural and highway segments have taken off, the urban business has lagged behind.